by Paul M. Collins and Lori A. Ringhand. New York: Cambridge University Press, 2013. 296pp. Hardback $99.00, ISBN: 978-1-107-03970-4. In SUPREME COURT CONFIRMATION HEARINGS AND CONSTITUTIONAL CHANGE Professors Collins and Ringhand take the reader on a revelatory contrarian journey. Eschewing conventional wisdom, they argue from the opening page, and convincingly so, that Supreme Court confirmation hearings are not the vapid exercises so often portrayed. Rather, they do matter ‒ fundamentally so, serving to validate critical junctures in the development of the American constitutional canon. Indeed, the authors posit a "celebratory" view (p.2) of the hearings, underscoring the role that they play in offering focused conversations and debates about constitutional meaning, in effect serving as a democratic forum for the discussion and ratification of constitutional choices and constitutional change. Painting their argument on a large palette, the hearings are linked intimately to democratic theory, serving as a vehicle through which "the people" make their constitutional wishes known in the colloquy between public opinion, senatorial questioning, and nominee responses, and these wishes must be taken account of as "confirmation considerations" all nominees must meet if they are to be confirmed to the Court. In such a portrait, Supreme Court confirmation hearings offer windows in American constitutionalism to concrete understandings of what is settled, what is not and, perhaps, what is being revisited in a two-way street that engages the public, both through their opinions and their representatives, and the Senators themselves, with the nominee. The authors' burden is a big one, particularly in the context of the conventional wisdoms piled against their thesis. That said, as I read the book, it continually brought to mind an analogous tall order, the analytical distinction drawn by Bruce Ackerman over two decades ago between "normal" and "constitutional politics" (Ackerman, 1991). While the Court may decide cases on a day to day, year to year basis, exhibiting varying levels of dissensus in their holdings based on the push and pull of multiple "acceptable" answers to the questions before it ("normal" judicial decisions), there are certain junctures in constitutional evolution, as illustrated and ratified by Supreme Court confirmation hearings, that reflect virtually universal consensus ("constitutional" judicial decisions) on certain fundamental constitutional choices (with the acceptance of the fundamental choice made in BROWN as the prototype) that, at a certain point in time, are consensually accepted and no longer, at least for now, subject to debate. This process, as was the case with BROWN, may take time and may not be linear but, at some point in time, case [*491] decisions attaining this status are agreed to have been based on "right" answers. Clearly, Collins and Ringhand do not make quite so bold a claim for their thesis yet it emerged for me, nevertheless, as at least implicit in their argument. 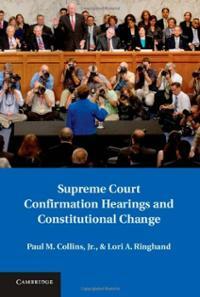 In making their case, Collins and Ringhand touch numerous bases in thematic chapters, with Chapter 2 offering an extended description, from start to finish, of Supreme Court nomination processes and advice and consent procedures. Historical examples lend richness to the discussion of the opportunities and constraints framing presidential choices and, included, for illustrative purposes, is a case study of the most recent appointment to the Court, that of Elena Kagan. Chapters 3 through 5 are predominantly driven by analysis of the extensive empirical data set on all hearing exchanges developed by the authors, with Chapter 3 exploring the general link between contemporary public opinion, judicial precedents and hearing dialogue. Chapters 4 and 5 extend this analysis through a more explicit focus on the issue orientation of specific hearings and, as well, a focus on explicit discussion of precedents across the nomination hearings. The subsequent analysis in Chapter 6's discussion of "Confirmation Conditions" does the heavy lifting for their thesis, documenting the entry of BROWN into the constitutional canon through hearing exchanges, the similar developments for lending the assertion of gender rights some heightened level of review, and the emergence of the perception of the LOCHNER decision as inherently "wrong," placing it among those that become part of the Court's "anti-canon." The chapter concludes on a somewhat speculative note with the argument that the recognition in HELLER of an individual right to gun ownership is on a fast track to gaining canonic status. Chapter 7 applies Collins and Ringhand’s thesis to a fascinating juxtaposition of Robert Bork's hearing, leading to his failure to gain confirmation, and the subsequent success of Anthony Kennedy's winning confirmation only three months later. Employing considerable documentation from both hearing transcripts it is well argued that Bork was defeated not because he didn't answer questions, as is often charged but, rather, because he gave the wrong answers when the hearing conversation turned to canonically accepted constitutional precedents. In short, his responses failed to meet accepted confirmation conditions. Kennedy's hearing was, however, an exercise in "time traveling" despite its temporal proximity to Bork's, with the full embracing of all of the facets of the confirmation conditions, the recognition of the "new" consensual canon, that Bork's defeat had signaled. Chapter 8 examines the currently contested issues before the Court and the tendency for nominees to skirt definitive answers on them, thereby underscoring their non-canonical status. In the concluding chapter, Collins and Ringhand offer an appropriate summing up of their argument and the evidence that they have brought to bear in its support. The structure of the volume highlights the necessity for a multi-method approach to the analysis combining extensive data generation and its reporting on the one hand, coupled with rich description, historical research, [*492] focused sidebars, case studies and some good old fashioned story telling. The methodological choices made are sensible ones, such as in the one year lagging of the independent variables in the statistical presentation to allow them sufficient time to impact subsequent hearing discussions. Broad brushstroke independent variable measures are utilized that are far from laser-like yet, generally, satisficing through much of the analysis. Offering alternative analyses as, for example, studying the linkages between public opinion and hearing dialogue with both the inclusion and exclusion of those issue areas in which the Court rarely engages (the Economy and National Security) allows the reader to better assess the strength of their argument. More generally, there is much else to recommend the book. It is engagingly and well written, not always a given in academic work. The footnoting is beyond extensive, offering a treasure trove of back alleys for exploration by readers. And, as alluded to, extensive sidebar presentations and case studies can be of great illustrative and anecdotal value. Among the sidebars this is especially true of those focusing on the relationship of Hugo Black and the Ku Klux Klan, how that was skirted at his hearing, and the implications that followed for the public opening of the subsequent Frankfurter hearing. Other valuable sidebars examine the mood and culture changes evident in the conduct of hearings between Frankfurter and Kagan in “Of Vampires, Werewolves and Chinese Restaurants” and there is an historically compelling sidebar on the tense exchanges between Senator Strom Thurmond and Thurgood Marshall at the latter's confirmation hearing. Equally valuable case studies, already mentioned, examine the Kagan nomination and advice and consent processes, the extensive study of the Bork and Kennedy hearings, and exploration of the canonization of the BROWN ruling across a number of hearings. All this is well and good but the nature of the reviewer's task is to quibble as well. For one, the book's thesis is, as noted, contrarian, and consequently at odds with conventional wisdom. Acutely sensitive to this Collins and Ringhand tend to deliver and redeliver their thesis with a heavy hand. Clearly, it bears repeating throughout the volume ‒ but not as much as occurs. As a general matter, the empirical statistically driven chapters (3-5), perhaps inevitably, are less rich than the qualitatively driven facets of the study, not simply because they are "data driven" per se but, rather, because they have a somewhat arid feel that one (this one!) associates with journal articles. In some parts of the analyses the broad based variables, such as issues, even when teased out to the underlying sub-issues, lack sufficient power to carry successfully the authors' argument to the lengths they would like to see it go. Thus, for example, while the mega-inclusive Civil Rights issue variable is broken down into subcomponents, such as Race Discrimination, it is critical to recognize that even that nomenclature subsumes cases that are far from fungible, such as the necessity for cases involving segregation and affirmative action to occupy the "same" sub-issue. Since the sub-issues are somewhat lacking in analytical power, this is one part of the analysis that begs additional and more finely tuned study. Not to belabor the [*493] point, but this is also dramatically evidenced in the sub-issue identified as Gender and Sexual Orientation, an "issue area" that is far from harboring analytically fungible cases and one demonstrating vastly different precedential development. Relatedly, it should be pointed out that the chapter examining the discussion of precedents at hearings is, virtually by definition, more successful than that focused on issues because of the discrete and identifiable nature of specific precedents as distinct from the much more amorphous issue/sub-issue taxonomy. Two other critical points warrant raising. For one, Collins and Ringhand recognize the important distinction between nominees embracing versus subsequently acting on a recognized canonical consensus but, I think, are too willing to dismiss its importance for their thesis (which is arguable) while downplaying the distinction's empirical occurrence (which is less so). I am willing to grant, for example, that Justices Roberts, Alito and Thomas have "embraced" BROWN (and other holdings) as part of the canon yet, nevertheless, while never disowning or refuting the fundamental judgment in Brown they remain successful in applying its canonical meaning quite differently than those justices who have a much broader view of what Brown's "consensus" truly means. This underscores a second point ‒ recognizing the elements of a consensual constitutional canon that all Supreme Court nominees embrace is a highly interpretive exercise, one that will engender disagreement among the book's readers. Clearly, BROWN (despite the comments above) remains the canonical prototype. The arguments made in the book for canonical acceptance of some level of higher scrutiny in gender cases is less compelling and, as Collins and Ringhand recognize, the Court's ruling on Obamacare does seem to suggest that the door is ajar on the anti-canonical status of LOCHNER. So there is the possibility that canons will come and go ‒ and at what point in their doing so would the canonical edifice need some restructuring, clearly a point where we do not find ourselves now in relation to their thesis. The vexing problem of interpretive judgments remains, however, and I, for one, am not as willing as Collins and Ringhand are to label the HELLER decision as canonical in waiting. Such concerns notwithstanding, Collins and Ringhand's SUPREME COURT CONFIRMATION HEARINGS AND CONSTITUTIONAL CHANGE is an important addition to the literature on Supreme Court selection politics generally and the most important study available on confirmation hearings per se. More generally and, at least as importantly, it carries important messages about the interface between confirmation politics and democratic theory, ones that have certainly changed the way I will view and evaluate Supreme Court confirmation hearings past and future. Ackerman, Bruce A. 1991. WE THE PEOPLE: FOUNDATIONS, Cambridge, Massachusetts, Harvard University Press.